I am no expert on Indian cooking. To the contrary, I am a complete newbie, having only tasted my first Indian fare earlier this year! But, I am hooked! I am in a cooking club called "Cook My Book" and one of the cooks submitted an Indian cookbook this year. It’s a great cookbook and I ended up buying it! Now, the Indian food I a have had, and cooked, seems to have quite a bit of lemon involved, so I decided to make some naan with lemon olive oil instead of the plain vegetable oil called for in the recipe below. I’m glad I did and you will be as well! This naan is actually better than what we have had in the Indian recipe we go to (and really like!). I asked my Indian friend and neighbor, who also loves to cook, to try my naan out and she gave it a big thumbs up! Mix the flour, salt, baking soda, and oil in a bowl. In a second bowl, mix water and the yeast til well combined and then add the yogurt. Add wet ingredients to the dry ingredients. Add water little by little until a dough forms. Knead the dough. Add more flour if the dough is too wet and sticky. Cover the bowl with a towel and set aside for 3-4 hours for the dough to rise. Then knead the dough again and divide it into 8 portions. Shape each part into a ball and set the balls of dough on some flour until you are ready to roll it out. One by one you will take a ball of dough and lightly press between your fingers to flatten. Continue to flatten, using a rolling pin, until your dough is roughly 3 x 5 inches. Preheat the broiler. Place a sheet of aluminum foil right on the oven grate nearest the heating element and place up to four naan on it. Shut the oven door and when they puff up, flip to the other side. This will happen quickly, so stand by! Remove and brush with melted butter. Serve hot. They are so delicious they will fly off the serving plate; but they are also filling, so plan on only 1-2 per person. P.S. 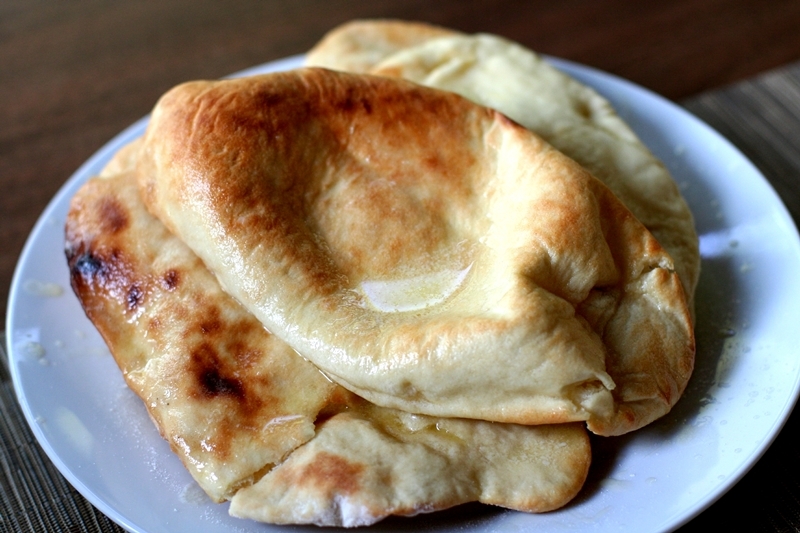 I posted another naan recipe for Susan’s Bread Challenge a few months ago. The naan recipe above is far superior! OMGeee I am typing this while in a "naan coma". This is at least the 4th naan recipe I've tried and I have just never been satisfied with any of them. This one was fantastic and I am definitely saving this in my recipe book! Mine didn't puff up quite as much as yours did in the picture but they did still puff - which in and of itself is often hard to achieve - and they were airy. I didn't have Lemon EVOO so just used plain but we were eating with Chicken Tikka Masala so it was fine as was, with just butter melted on top. I am curious to try with the lemon flavoring next time though. (I usually do a garlic and cheese naan). Anyways, just wanted to thank you so much for this recipe! Love it! I am so glad you liked it! We loved it too!! And I was the same way, had tried other recipes before and even posted one of them here on 37 Cooks but this recipe was so superior! I won't be looking for another recipe! Try the lemon EVOO if you get a chance - wow, it was really fantastic! And for that matter, try it with garlic and cheese like you have others - that would be wonderful! Thanks so much for writing! Hope you will follow our blog! OMG - YAY! So glad you made them! They are so so good, yes? They were amazing! This is by far the best and easiest naan recipe I have ever tried. Awesome! This makes me want to go make more!